Recent projects have included the overhaul of the church's 1,668 pipe organ which is more than 100 years old; the restoration of the weathered 'Benson' West Window and currently the renovation of the ancient 14c clock mechanism. Like many ancient churches, St Mary’s has a continual need for regular repairs and restoration work. Our Friends help contribute towards the costs of preservation of the fabric of the church, towards repairs, replacement of major items, and help with the maintenance costs of fixtures of special importance. the fabric of the church is preserved for future generations. the church continues to be an important part of the community of Rye and available for the many visitors who come to this part of the South Coast. Automatic free admission to the Church Tower and its magnificent views over town and marsh. Invitations to a lively programme of lectures, tours, concerts and social events organised by the Friends. 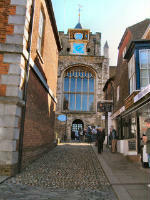 But the real benefit of being a Friend lies in knowing that one is helping to look after Rye’s landmark church, which plays such an important part in the life of the town – a visual focal point, a visitor attraction, a place for public events, as well as being a centuries-old centre of worship. To become a friend, simply fill in the attached form and either hand it in at the church or mail it to the Membership Secretary, May Cottage, Jarrett’s Close. The annual subscription is £10, or £15 for couples.